At present, local human activities (overfishing and destructive fishing, marine-based pollution and damage, coastal development, and watershed-based pollution) threaten an estimated 60 percent of the world’s reefs (75 percent when including thermal stress). Without intervention, these pressures have trajectories slated to escalate into the future. By the 2030s, our estimates predict that more than 90 percent of the world’s reefs will be threatened by local human activities, warming, and acidification, with nearly 60 percent facing high, very high, or critical threat levels. 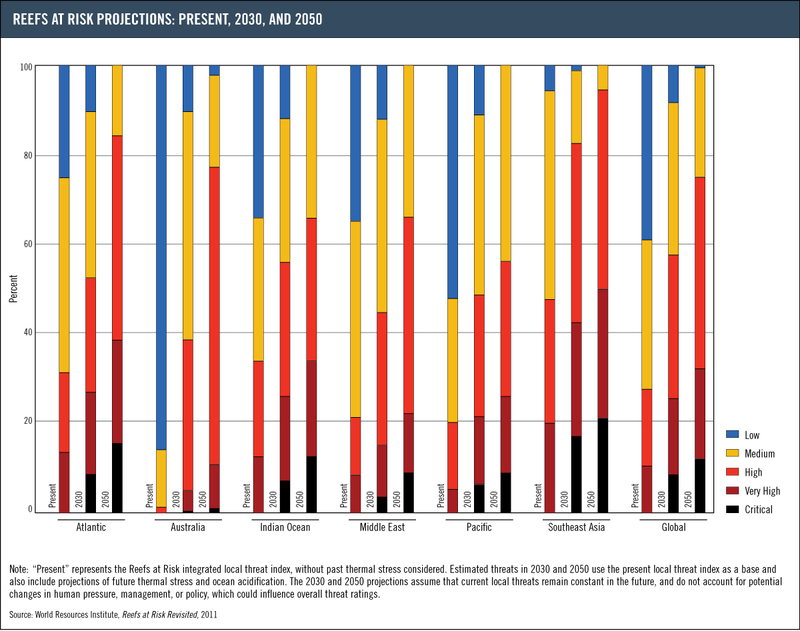 By the 2050s, estimates predict that almost no reefs will be under low threat and only about one-quarter will be under medium threat, with the remaining 75 percent at a high, very high, or critical threat levels.